One woman’s struggle to survive the South Sudan conflict in leaving behind her homeland to seek refuge in Kenya. Kakuma refugee camp, Kenya Eight months pregnant and fearing for her life, Nyayang Bol Biel gathered up her two young children in the dead of night and prepared to embark on a 500-mile journey that she prayed would save their lives. Nyayang had already lost many friends and relatives to the war that had raged around her for almost two years. Now, soldiers were tightening their grip on the marshland in the remote northern area of South Sudan where she and her family were eking out a fragile existence. As she headed for the safety of Kakuma refugee camp in northwest Kenya, Nyayang left behind her parents, her four sisters and three brothers, knowing that she might never see them again. But she felt that she had no choice. A year earlier, Nyayang’s hometown of Leer in Unity State had been razed to the ground, forcing her and her community into the bush. Now she was no longer safe even in the swamps. Nyayang is one of more than two million people who have been displaced by civil war in South Sudan. In a tragic reversal of the jubilation that marked the nation’s independence from Sudan in July 2011, the war has consumed more than half the lifetime of the country. 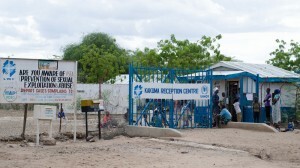 The conflict began in the capital, Juba, in mid-December 2013 as a political dispute between the president, Salva Kiir, and the former vice-president, Riek Machar. But it quickly adopted a tribal dimension, embroiling millions of people in a war that has consumed three of the country’s 10 states. The tribal lines of the conflict are complex, but broadly speaking have pitted the country’s largest tribe, the Dinka of Kiir, with the second-largest, Machar’s Nuer. Nyayang was forced from her home in early 2014 after government forces attacked Leer, the home town of Machar. In some areas, the violence left little evidence of habitation beyond the black stain of burned embers on the ground. For more than a year, she and many others fought for survival in the swamps of southern Unity state. In April and May 2015, intensified fighting in the area displaced another 100,000 people. Fragile though their existence was, Nyayang and her community were safe from the fighting. But even this scant consolation has evaporated in recent months, as government soldiers have begun killing Nuer even in the bush. “Before, they didn’t know where you were, but now they come looking for you in the swamp and if they find you they start killing you,” says Nyayang. The slaughter of civilians has been a routine part of the conflict, and human rights organisations have documented numerous war crimes and human rights abuses. Nyayang and her community have witnessed at first hand this indiscriminate killing. Nyayang realised that she could no longer live in constant fear of being killed. Despite the risks involved, she decided to head for Kakuma refugee camp, home to almost 100,000 South Sudanese refugees. 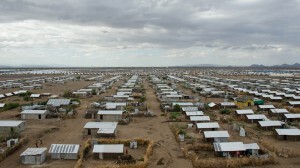 Some South Sudanese have been at Kakuma since an earlier civil war, between Sudan and southern Sudan, which between 1983-2005 killed an estimated two million people. Nyayang is among the many thousands who have fled there to escape the more recent conflict. “I heard from someone that if I came to Kakuma I would be safe and that there would be food,” she says. The journey to Kakuma was perilous. The first step was to reach the United Nations Protection of Civilians (POC) camp in Bentiu, where the UN is providing sanctuary for more than 100,000 civilians. Under the cover of darkness, Nyayang walked almost 70 miles with her husband, their five-year-old daughter, Nyankul, and two-year-old son, Tony. Such was the danger of moving that the journey to Bentiu took a week. Once there, Nyayang was forced to leave her husband behind. 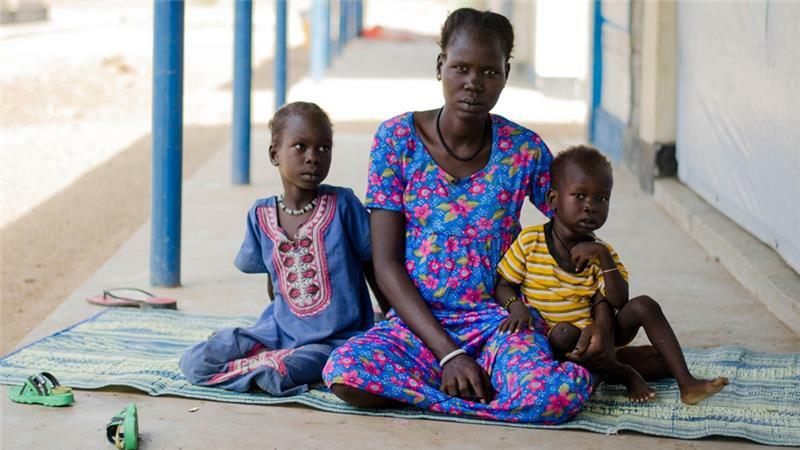 Nyayang and her two young children were taken to Juba by UN helicopter. Once there, they were still more than 200 miles from the Kenyan border. They found a vehicle to smuggle them to the border, cramming into the back of the seven-seater lorry with more than a dozen others. Travelling along an unlit, unpaved road to Kenya via the town of Torit in Eastern Equatoria, Nyayang and her fellow refugees were at the mercy of wild animals, government checkpoints, and the relentless downpours at the height of South Sudan’s rainy season. After almost two weeks of travelling, Nyayang, Tony and Nyankul finally made it to the Kenyan border. After waiting two days to be picked up by the UN, they were taken to Kakuma camp, where for the first time in more than a year, Nyayang felt safe. When Nyayang arrived at Kakuma, there was not enough space for her family to join other members of her community, and after several weeks she and her children are still living in a transit centre while they wait for the UN to expand the camp. But now that she is finally safe, Nyayang’s concerns are no longer for herself, but for those she has left behind. A peace agreement was signed between the warring parties in August. But the fighting has not stopped, and Nyayang is not hopeful that there will be peace. Even if there is a ceasefire, Nyayang doubts that she will return to her homeland. This article was originally published by Al Jazeera here. This entry was posted on Tuesday, December 29th, 2015 at 2:16 pm. It is filed under Al Jazeera, Conflict, Human rights, Reportage, South Sudan, Sub-Saharan Africa and tagged with civil war, conflict, displaced, human rights, Kakuma, Leer, peace, refugee, Riek Machar, South Sudan. You can follow any responses to this entry through the RSS 2.0 feed.